Have you seen the movie Memoirs of a Geisha? If you haven’t, I recommend the movie. If you have, then the first couple of pictures may look familiar. 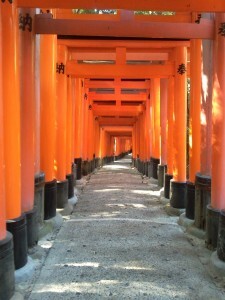 This is at the Inari Shrine in the South East end of Kyoto. 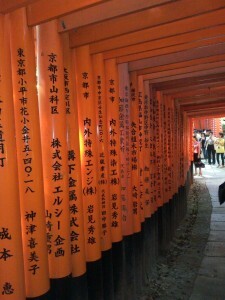 It was amazing to see the long walk ways of posts with Kanji written on each one. 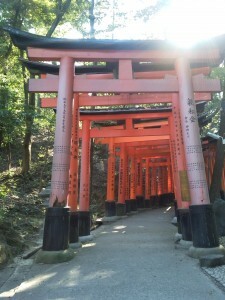 The Inari shrine is dedicated to the fox god. And has many festivals held at that location. There were a lot of other tourists at the site, it was very difficult to capture pictures of walkways with no people walking through it. The only down side of seeing these beautiful walkways were the mosquitoes. They were honestly having a blood fest with me. It was like I was made of sugar to them. By the time we were walking down, I honestly looked like I had chicken pox all over my legs. But it was worth it because I loved Memoirs of a Geisha and I always wanted to visit a shrine like they showed in the movie with the little girl running through the walk ways. The next couple of pictures are from my school. 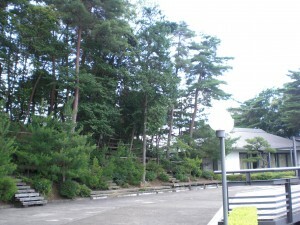 I went on an adventure because the Kyoto Institute of Art and Design is built on a hill. Even though there is a hike up the stairs every day, the view is definitely worth it. They have a patio like structure that is right next to a forest like area. It is very green. 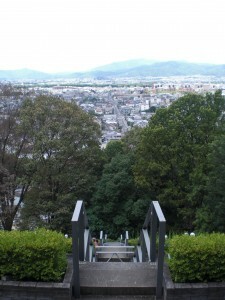 Kyoto in general is a very green environment, both physically and economy wise. And at the entrance after the hike up the stairs, there this really cool abstract art that is in the middle of a pool of water that looks like a china wall, with the water looking like it痴 falling off at the edge. My first local festival was definitely really interesting. In the town of Haradani, there is a monthly festival where they celebrate their religion and fortune and write their hopes for the future. The next picture is me standing in front of the main shrine and the jars behind me are full of sake, which is meant for good luck with the spirits. 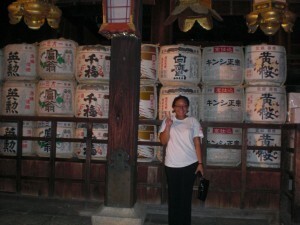 Sake is the traditional alcoholic drink the Japanese have had around for centuries; it is like a rice wine for them. 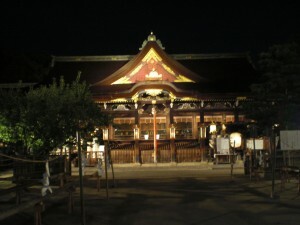 The picture on the right is the larger picture of the whole shrine. The sake jars are to the left of the bigger picture. 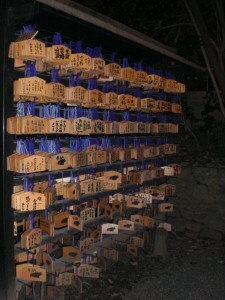 The next pictures are the rows of hopes and wishes people write on the wooden pallets. 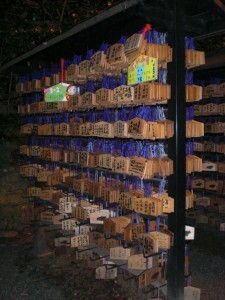 It was so cool because there are rows and rows filled with these wishes and prayers. The next couple of pictures are my host parents and they are bomb. My host family actually in general is pretty sweet. The parents speak a little English but the two sons are learning English and I can converse with them. But we usually meet half way and speak half English and half Japanese so our conversations can last longer. 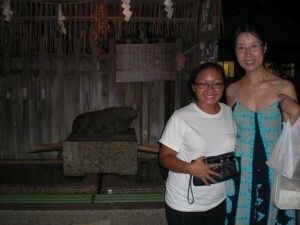 My host mom’s name is Keiko and she is an Elementary school teacher. The father is also an elementary school teacher but for disabled kids, which I thought was pretty great. The eldest son is 21 and is on his last year of college at Osaka University. The middle child is a girl she　iｓ 19 and also at Osaka University. The youngest is 16 and in high school. All their kids play Judo and the eldest son and daughter are undefeated in Kyoto. They’ｒe raining champs. The only daughter is very sports orientated, she started Judo when she was young and picked up diving and sumo wrestling. Keiko-san is the person I see the most out of the family because she is always cooking and in the kitchen when I come home from school. The father is pretty cool too; he is into ball room dancing which I thought was awesome because I took ball room dancing in high school. So, he took me to one of his dance lessons and it was super fun because I got to dance the waltz, tango, rumba, jitter bug and the cha cha. The guy farthest to the left standing with the black t-shirt is my host dad. The rest were other dancers. 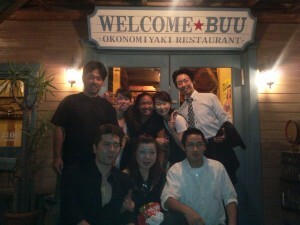 The boy on the bottom right corner with a white t-shirt and glasses is the youngest son of Keiko-san and Soya-san. Even though the weather is about a 100 degrees average, I really am enjoying touring around Kyoto, I am finding so many cool things and interesting people. I definitely want to come here again, possibly when the weather isn’ｔ out to get me. 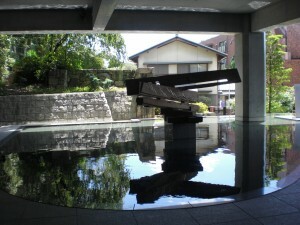 This entry was posted in Mahal Brillantes '12, Japan. Bookmark the permalink.